BERRYESSA: Water is clean despite the recent rain. Trout can be found in depth from 40 to 110 feet below the surface. Bite is up and down. Salmon are harder to come by. This is a good time to fish the coves with live minnows under bobbers. 707-255-5544, 916-502-3474. CHABOT: Water is coming in from Upper San Leandro Reservoir, so the lake has risen two feet in the last week. There is a lot of debris in the water, and there is very little visibility. Boaters have been struggling. A 6-pound trout was caught Tuesday by Robert Hernandez of Hayward from the shoreline near the Handicap Dock. A plant of 1,000 pounds went in Tuesday. 510-247-2526. CHESBRO: A few bass are being caught off points via drop-shotting or casting Senkos. Action is on the slow side. 408-463-0711. CONTRA LOMA: Lake level is low due to vegetation management project, but fishing has been good. Trout fishing is good with Power Bait or nightcrawlers. Try the boat ramp or East side. Catfish bite is slow. Bass are active. Big fish of the week was a 9.4-pound trout caught by Charlie Hayes of Pleasant Hill. 510-544-3154. DEL VALLE: Trout fishing is very good despite somewhat murky conditions. Trout are in the top two to four feet of water. Surface temperature is 56 degrees. Best spots are the East Beach and Narrows. Shore anglers and boaters can do well at both spots. Best baits have been Mice Tails, inflated nightcrawlers, gold Kastmasters or brightly colored Power Bait. 925-449-5201. LAFAYETTE: Trout fishing has been so-so because of muddy water conditions. Best solution is to use brightly colored Power Bait. A plant of 1,000 pounds of Mount Lassen trout went in Tuesday. 925-284-9669. LOS VAQUEROS: A plant of 1,000 pounds of Mount Lassen trout went in Wednesday. Trolling Rapalas or Kastmasters on the east side or in Peninsula Cove is the best way to get trout. Some schoolie stripers are being caught by trollers and bait anglers. Water conditions are good and there is three to four feet of visibility. 925-371-2628. QUARRY LAKES: Big fish of the week was caught by Russell Van Duren of Fremont, who nailed a 9.11-pound trout trolling with a Little Cleo. Six trout larger than 5 pounds were caught last week. Kiosk Cove and Fishermen's Row are best spots. 510-544-3133. SAN LUIS RESERVOIR: Bite is slow on the big lake. Best spot is the Trash Racks. Use live minnows or troll with plugs. A 20-pound striper was caught Saturday from the Forebay. Forebay is a better bet than the main lake. Minnows, anchovies or pile worms are good baits. 408-463-0711. SHADOW CLIFFS: A plant of 1,000 pounds of trout went in this week. Mice Tails, Power Eggs, Power Bait or nightcrawlers get trout for bank anglers. 510-544-3230. UVAS: Drop-shotting and finesse lures get bass near the dam. Don't expect much size, but most are a pound. 408-463-0711. ANTIOCH: There is a lot of debris in the water. Stripers in the 18- to 20-inch range are being caught from the Antioch Pier. Much of the attention is focused on sturgeon. The north side of West Island has less stuff in the water. Bridge side of the island has more fish. A 64-inch sturgeon was caught from the shore at Ryer Island, and that angler reported hundreds of rolling sturgeon. 925-706-7400. BENICIA: Sturgeon search is on. Striper bite has waned. Good afternoon incoming tides and big outgoing tides should make good fishing at Mothball Fleet, Grizzly Bay and the Middle Ground. 707-745-4921. 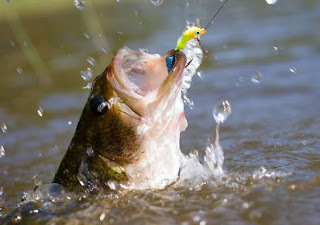 FRANKS TRACT: Striper bite is good, black bass is less so. The water near Discovery Bay is best. White swimbaits are working well in the murky water. 925-625-2441. PITTSBURG: There's a lot of debris in the water. The key is to stay in shallow water where there is less current. Honker Bay and Broad Slough fit that bill, but action is for schoolie stripers. Sturgeon are near Buoy 2 and 31. Pittsburg Marina and Dockside Bait & Tackle this week will hold a sturgeon and striped bass derby. Entry fee is $35 and includes lunch. All proceeds go to prizes. 925-252-0151. RIO VISTA: Stripers are being caught along the levee at Sherman Island and Cache Slough. Hyacinth in the water has been a problem. Sturgeon anglers go to Cache Slough and the Power Lines. Blood worms, pile worms, salmon roe, eel and shrimp baits all get attention. 707-374-2372, 916-777-6498. NAPA: Sturgeon bite is good in the lower river but there is action all the way to the train bridge. Grass shrimp is the best bait. Ghost shrimp, mud shrimp and eel will work. There are a lot of small fish being caught, so action is steady. Keepers also are being caught. 707-255-5544. RUSSIAN: River is high and muddy, and more rain is in store. 707-869-2156. BERKELEY: Boats have been concentrating on the Marin Coast and getting fair number of lings to 18 pounds. Most boats get a half-dozen per trip. Otherwise, it's limits of crab and cod. 510-849-3333, 510-223-5388, 707-334-4827. BODEGA BAY: The New Sea Angler continues to get limits of cod and crab. Lings go to 20 pounds and trips bring back nearly a fish per rod. There hasn't been a miss yet. Most trips are back before noon. Humboldt squid trips will begin after Jan. 1. 707-875-3344. EMERYVILLE: Two trips went out this week. On Monday the New Huck Finn had 27 limits of crab and rockfish and 5 lings to 12 pounds, and on Tuesday the New Seeker had 23 limits of crab and cod and four lings to 10 pounds. Trips will run through Dec. 31. 510-654-6040. MONTEREY: Trips are getting crab, cod and Humboldt squid. Monday's trip had 90 crab, 100 squid and near limits of rock cod while fishing locally. 831-375-5951, 831-372-7440. PACIFICA: High tides have stirred up the water and made it dirty. Crabbing has been so-so. Most of the catch are females that should be released. Not a lot of fish. Most are king fish. 650-355-8303, 650-359-9790. PILLAR POINT: Cod fishing remains consistently good. Queen of Hearts has been venturing south toward Pigeon Point to fill sacks. The crab/cod boats from Bait & Switch are getting limits of both crab and cod. 650-726-7133, 510-581-2628. PORT SONOMA: Sturgeon and striper are both on the bite. Stripers are being caught at Black Point, mouth of Sonoma Creek and the Napa River. Sturgeon are all over, especially at the Napa River, China Camp, Sonoma Creek. Pile worms, ghost shrimp, eel all are available at Leonards. Boaters in the Napa River need to watch for debris. 707-762-7818. SAN FRANCISCO: A 53-inch sturgeon was caught Sunday from the Oyster Point Pier. Sturgeon also were caught near Coyote Point and the A-Crane at Hunters Point. 650-589-3474, 510-703-4148. SAN PABLO BAY: Sturgeon fishing is decent. Pumphouse is the place to go. Bring mud shrimp. There are still bass around, not enough for limits, but enough for entertainment. 415-456-0321.